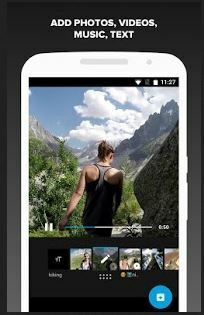 MP3 Rocket is an app to download and convert videos to MP3. MP3 Rocket sure seems to be a useful app but it's not free of problems. There are compatibility issues with the app. Basic and Pro versions don't work on Mac. That means there is no MP3 Rocket for Mac. What you need is MP3 Rocket for Mac alternative that really helps you to convert YouTube to MP3. Don't worry! Here is the best solution for you. iTube Studio for Mac is undoubtedly the best MP3 Rocket Pro for Mac (macOS High Sierra included). 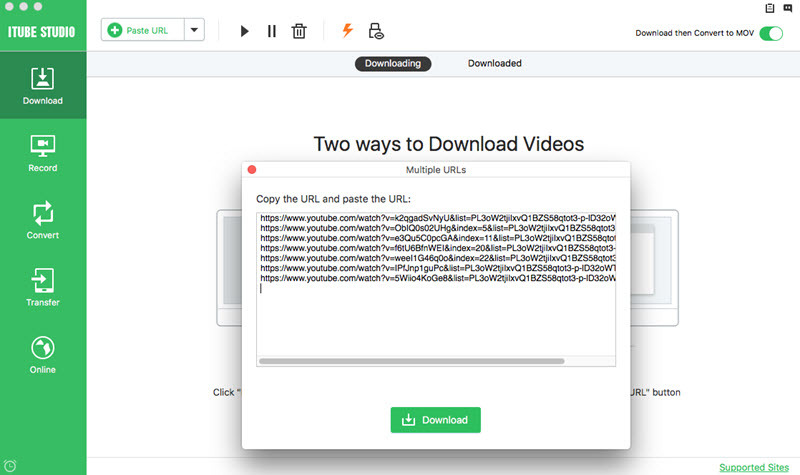 It's one of the easiest YouTube downloader and converter for Mac (macOS Mojave, High Sierra, Sierra and EL Capitan) that enables you one-click to extract MP3 from YouTube, Facebook, Vimeo, DailyMotion, Vevo, Veoh, and up to 10, 000+ sites. Like MP3 Rocket, it downloads and converts video at lightning speed - batch downloading is features. Let's look at some of its key features. 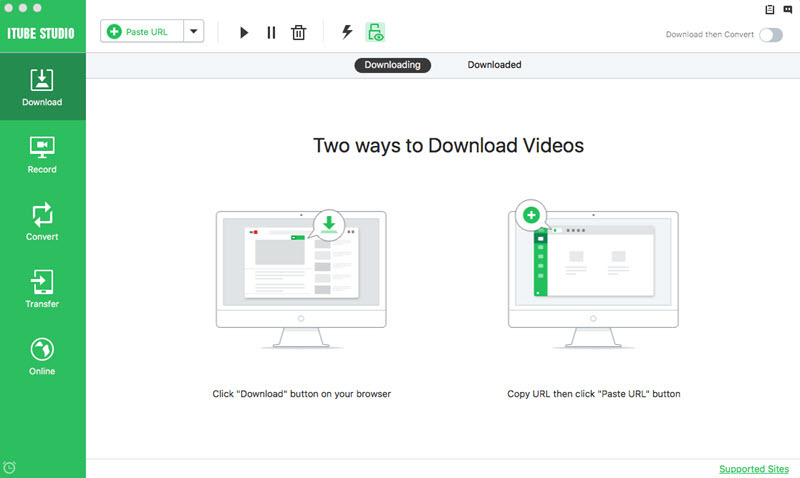 Download HD videos fast from a large number of video-sharing sites like YouTube, Vimeo, Facebook, Dailymotion, Metacafe, VEVO and 10, 000+ more. 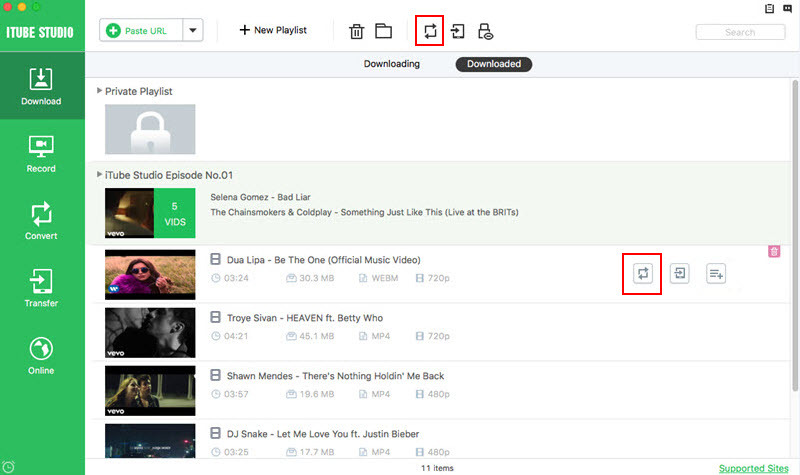 It automatically detects the video playing on your browser, and using a smart Download button to download the video. It converts videos that you have downloaded to any audio/video format. You can even convert online videos for use with iPhone, iPad, iPod, and other portable devices. It converts YouTube videos to MP3, while maintaining perfect audio quality. 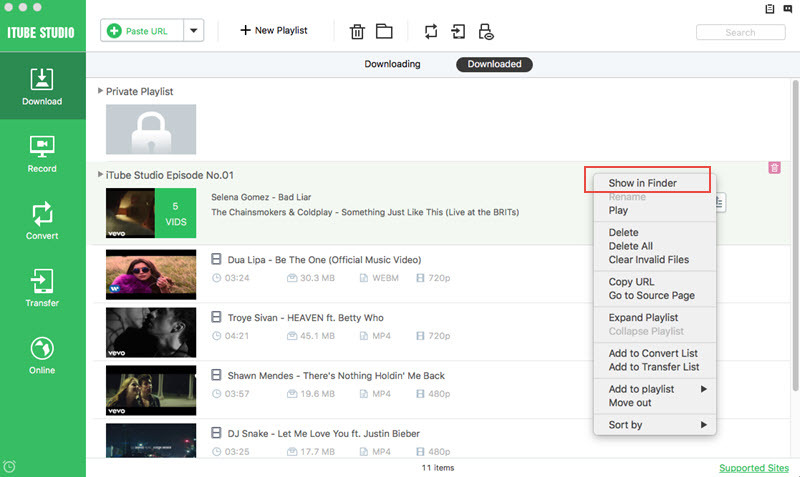 You can directly export the videos to iTunes or transfer the videos to iOS and Android devices. 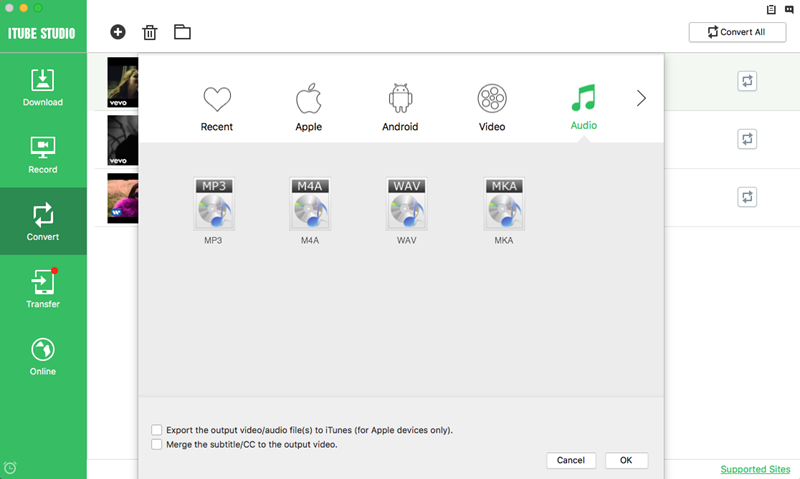 Download and install iTube Studio for Mac. A wizard will guide you through the process step by step. When complete, a download button will be integrated into your selected browser(s). You can then run it from "Applications" folder. From now on, you can watch YouTube in Safari, Firefox, or Chrome, and save it to MP3 anytime you want. Now go to YouTube.com with your favorite browser and play the video you want to download. Mouse over the YouTube video player, and the "Download" button will appear at the top left corner. Click it to start capturing and downloading YouTube video. Alternatively, copy the YouTube video URL and click the "Paste URL" or drag and drop the URL to the dock. Both will start downloading YouTube video as you want. The downloaded video will appear in the "Downloaded" tab. To convert YouTube video to MP3, click the "Add to Convert List" icon to add the video to the "Convert" menu. And open the "Convert" menu and click the "Convert" button. In the window that shows, choose MP3 format from Common Audio category. Or you can directly choose iPod in the Apple category and similarly PSP in Game Devices. All popular formats and devices are fully supported. If an Apple device is chosen, you can tick the option "Export to iTunes" at bottom of the window. If so the converted MP3 file will be imported to iTunes library automatically. It's only a few clicks away from playing on your iPod. 1 Click Download YouTube to MP3: iTube Studio allows you directly download YouTube and other videos to MP3. First copy the video URL, and simple click "Download MP3" option. The video will be downloaded in MP3 format. If you want to transfer a video to any Android device, first add the downloaded videos to the "Transfer" menu. And connect your Android to the computer to start transferring YouTube to your Android phones or tablets. MP3 Rocket is a convenient & useful software that converts any video contents to MP3 formats or create ringtones. The best part is - in order to use this tool, you won't need any account! Just you'll need to download the software; there's no sign-up or rigorous registration process. However, MP3 Rocket is a Windows based software. So, if you own a Mac, you can't use this software as it is incompatible on Mac. Don't try to download the EXE file from MP3 Rocket website and run it on your Mac. You'll get a message saying "the download was corrupt" or so. Additionally, this useful app is not completely error-free. Rather, the users often encounter a wide array of issues while using this software (as listed below). Plus, you will also understand how to resolve these common issues while using MP3 Rocket. Issue # 1: Installation Fails - When downloading & installing this software on your computer, you may get an error like "Installation Fails". This can happen if your system already has a previous version of MP3 Rocket & the installation process conflicts with the previous versions. Step 1: Download MP3 Rocket installation file from their official website. Step 2: Run the installation process in order to reinstall this software. Step 3: Once the installation process is complete, restart your PC & relaunch the software. Issue #2: User Gets Fatal Java/JVM Errors - While the users are trying to use or launch the MP3 Rocket program, they experience Java/JVM errors. Solution # 2: As a solution to this issue, you will need to uninstall all the older versions of Java from your PC that aren't further needed. Once it's uninstalled, you'll need to perform a fresh reinstallation of the latest version of Java. Issue # 3: Error Message - "File Name Can't Contain Double Spaces" - Users often get the repeated error messages that the file name can't contain double spaces while they are changing the file names or trying to save the desired file. Solution # 3: The only useful solution for this particular issue is - you will need to carefully remove any double spaces or other special characters from the File Name field. Issue # 4: App Doesn't Open - When you double-click on the desktop icon, nothing happens. This is the case when the program gets stuck, it doesn't respond & freezes the entire system. Solution # 4: This application is Java-based. And, that's why you will need to add an exception for Java software in your security or antivirus software. If Java gets blocked by your antivirus software or Java is corrupted, then this program will not properly function until you again download Java. Issue # 5: Compatibility Issue - There is a well-known compatibility issue between MP3 Rocket Version 6.4.7 with Windows 7. Solution # 5: If you're using Windows 7 & you're also encountering the same issue, then uninstall MP3 Rocket & reinstall the latest version of it. Make sure, you do not install the version 6.4.7 for Windows 7.